Months ago when administrative policy began to separate families at our southern border, American response was swift and ardent. This practice was not reflective of our most basic American values. But most Americans are unaware that the separation of parents from their children continues in cities throughout our country. Immigrant parents without legal immigration status throughout our country live in fear of arrest and separation from their children. In previous years, Immigration and Custom Enforcement (ICE), the police force charged with enforcing immigration laws, prioritized their limited resources toward arresting and deporting undocumented immigrants with criminal records. That policy shifted in 2017 with the new administration. ICE now prioritizes the arrest and deportation of anyone in the country without proper documentation, regardless of their family or community ties. That change has placed fear in the heart of immigrant parents and their children. A simple traffic infraction can lead to arrest, detention and deportation. One way immigrant families can be prepared in times of increased uncertainty is to designate a Power of Attorney who will be able to make decisions for the care of their children in case a family is separated through the arrest or deportation of a parent. 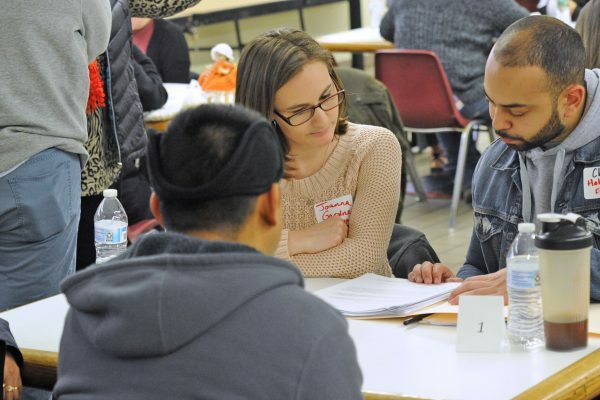 On Sunday afternoon, Rutgers University Law School partnered with parish immigrant leaders to reach out to these families. Under the direction of Joanne Gottesman, Clinical Professor of Law and Director of Immigrant Justice at Rutgers, and the supervision of additional Law School professors, more than 40 volunteers, students from the Law School, along with interpreters from Rutgers Spanish Department, helped immigrant families complete the Power of Attorney forms that allow parents to have a plan for the care of their children in case of their absence. At the end of the session, Rutgers students left happy with the opportunity to have used their legal and language skills to help others. Immigrant parents went home relieved to have documents which they hope they will never have to use. Sister Veronica Roche, SSJ is the former pastoral associate of Saint Joseph Pro-Cathedral Parish, Camden.